Ingredients: Water, Glycerin, Cyclomethicone, Prunus Amygdalus Dulcis (Sweet Almond) Oil, Cetearyl Alcohol, Butyrospermum Parkii (Shea Butter), Propylene Glycol, Ethylhexyl Palmitate, Glycine Soja (Soybean) Oil, Dimethicone, Fragrance, Glyceryl Stearate, PEG-100 Stearate, Phenoxyethanol, Benzyl Alcohol, Panthenol, Ceteth-10 Phosphate, Dicetyl Phosphate, Xanthan Gum, Carbomer, Methylparaben, Sodium Hydroxide, Disodium EDTA, Butylparaben, Ethylparaben, Isobutylparaben, Propylparaben, Yellow 6. 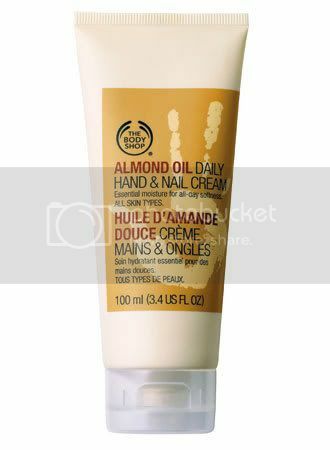 Enjoy lasting softness with a rich, moisturizing hand cream that has panthenol to make nails more flexible and prevent splitting. 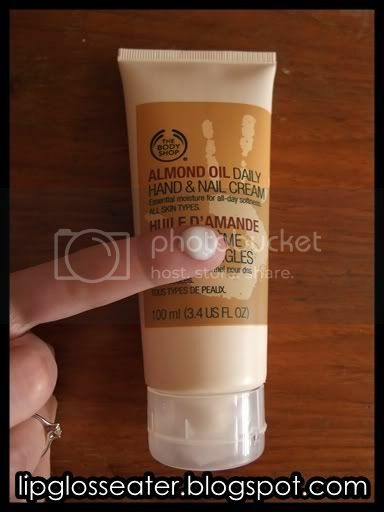 This handcream spreads beautifully, hence i only need a small amount (slightly smaller than a 5 sen coin) to cover both hands. 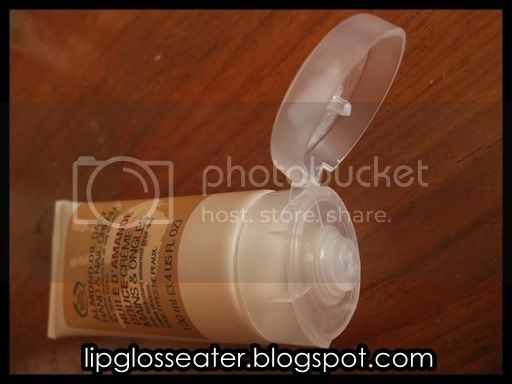 The cream sinks right into your skin, but be careful not too apply too much product else it can get really goopy and oily! I do not recommend biting your nails or sucking on your fingers after putting this in your mouth because the taste is rather nasty (and believe me the horrible perfumey smell stays in your mouth for eons!)! Scent wise it smells like almond / marzipan which i'm not a fan of, but have gotten used to it. My hands felt moisturized for up to 6 hours. I do feel the need to reapply after 3 hand washes or more. At RM39.90 / US$16, methinks that it is rather reasonable. As with most TBS products, the portion you get is generous, so you're getting your money's worth. 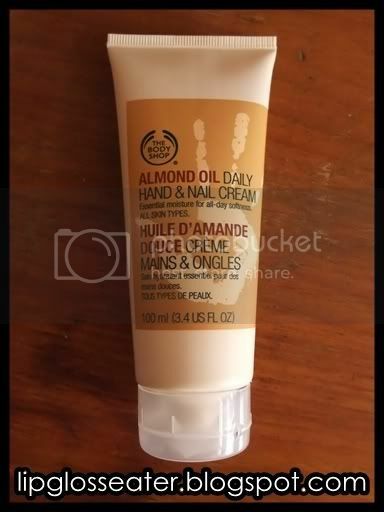 This is available at all TBS brick & mortar shops, as well as their official website (thebodyshop.com). I apply this twice a day, once after the first time i wash my hands / finish doing the household chores during the day, and one more time before i sleep. I also massage some of it into my rough, peeling cuticles. Repurchase: Yes, but as with all product freaks i want to try out others first before coming back to this! Rating: ! 4.5 Stars! Near HG Stuff!